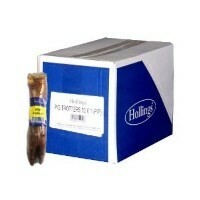 Hollings Pig Trotters Dog Treats are a high-quality dog treat, air dried to perfection and completely free of any bacteria. Suitable for all breeds and dogs of any age, you can be sure you are rewarding your dog with a treat packed with flavour and goodness. Keep your loveable companion occupied for hours with Hollings Pig Trotters. Bravo Premium Peanut Butter Twisted Stick 10"